I was awoken by a faint scratching sound. 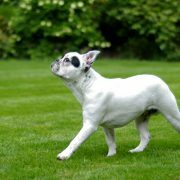 Scratch, scratch, scratch. At first I thought it was part of my dream, but the noise came again. Scratch, scratch, scratch. I opened my eyes and realised where I was. 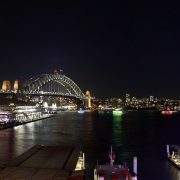 I was on Christmas Island. I had gone out in search of the migrating red crabs, and pulled over on the side of the road in a good spot to await their arrival. It had been a long week of late nights and having only spotted a few of the famous red crabs, I decided to close my eyes for a few minutes while I waited. I’m not sure how long those few minutes turned out to be, but the scratching noise that awoke me revealed itself as soon as I looked out the window. The scratching noise was, in fact, a red crab trying to crawl up the hubcap on my wheel. But there wasn’t just one crab. There were literally THOUSANDS clambering over each other, determined to make their annual journey from the forest to the beach. Apparently my rental car was an unwelcome obstacle that I had thoughtlessly put in their path. Christmas Island (named as it was discovered on Christmas Day in 1643) is closer to Indonesia than it is to Australia, yet it’s still classified as one of our own. Situated 2,600km north-west of Perth, the Australian territory has made headlines many times for its treatment of asylum seekers. 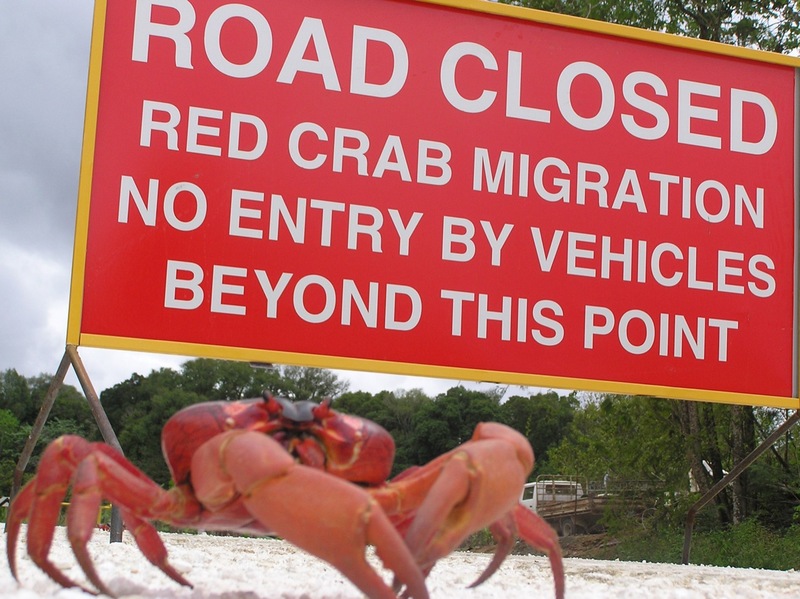 Well before there was a detention centre on Christmas Island though, there was something else that put it on the map – red crabs. “So what?” you might be thinking. Well, as you can see from the pictures, these red crabs take over the island at certain times of the year as they make the arduous journey from the forest to the sea to breed. 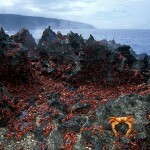 Compared to the 2,000 human inhabitants, the estimated 120 million red crabs dominate the island. These red crabs (Gecarcoidea natalis) spend most of the year in their rainforest burrows (or occasionally in people’s gardens) to maintain moisture. 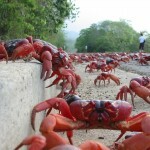 Once the rains start (generally around October/November) the crabs come out of hiding, and head towards the sea. The males head off first, taking a dip in the ocean to replenish their moisture before digging a burrow and waiting for the females. A week after the males set off, the females follow and then mating begins. 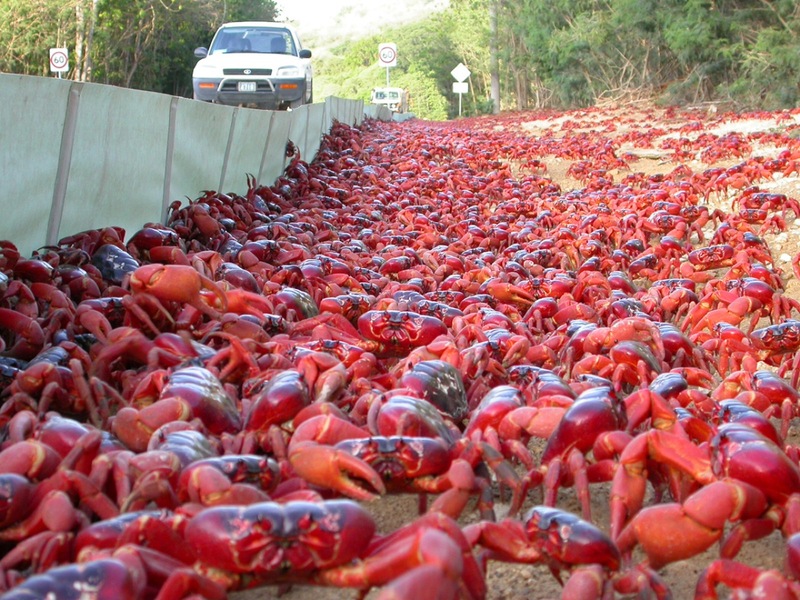 There are many dangers that the crabs face on their journey (including yellow crazy ants and cars) which wipe out quite a few of the adult crabs, as well as the returning babies. After mating, the males head back to the forest while the females remain in the burrows for a couple of weeks before releasing their eggs into the sea (which usually happens at dawn). The eggs hatch as soon as they come in contact with the seawater, and the larvae are left to fend for themselves for the next month. Any larvae (actually called “megalopae”) that survive the onslaught of rays, whale sharks and fish emerge from the water after this time only to have to battle more predators on land as they make the arduous journey back to the forest. 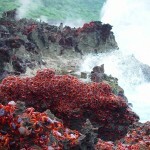 Red crabs are only a part of Christmas Island’s story. The island is home to 21 species of land or freshwater crab, and is a paradise for birdwatchers with 23 breeding or resident species of bird. There is even a Christmas Island birds iPhone app that you can use as a handy field reference guide. 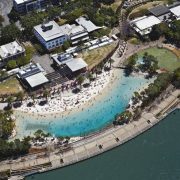 The island also features plenty of nature walks, fishing, scuba diving and a golf course. 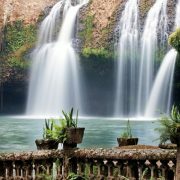 If you’re feeling adventurous, check out the blowholes, Hugh’s waterfall or venture down to the small cave known as “The Grotto” (great for taking a dip on a hot day). 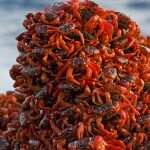 But for my money, there’s nothing quite as good as seeing the famous red crabs! Hiring a car (or 4WD) is recommended, and you can get all the information you need to plan your stay from the fantastic Christmas Island Tourism Association website. I’m interest in understand this creature , hopefully visit the island one day, would they attack human by way?